Swallowing disorders, known generally as dysphagia, can make seemingly routine things like eating and drinking difficult—even hazardous. A dysphagia diagnosis can be devastating, but SimplyThick can help to make what was once a struggle into part of a normal, easy routine. 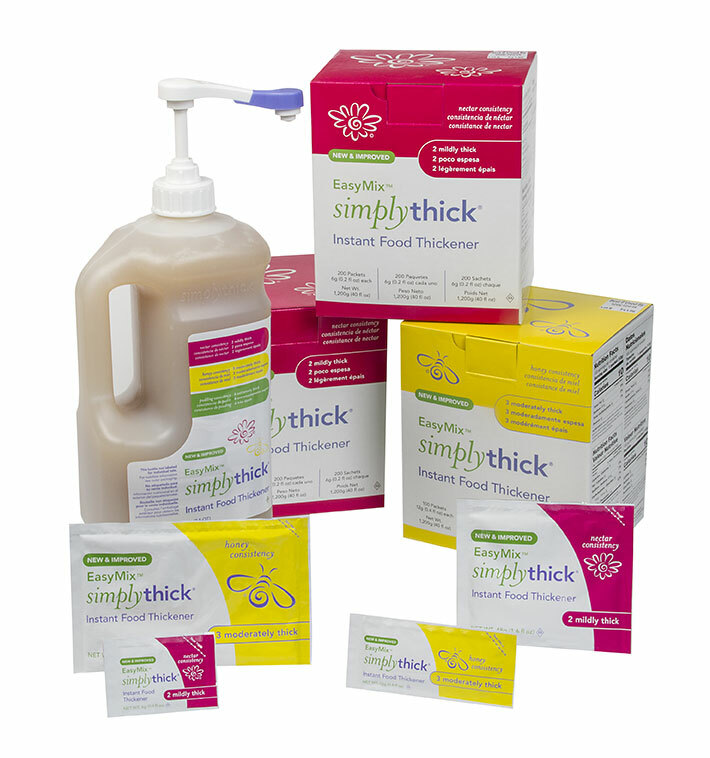 There are several brands of thickeners on the market, but SimplyThick is unique because it uses xanthan gum rather than starch to thicken liquids, making them thicker without compromising safety or taste—helping dysphagia patients enjoy the food and drink they’ve always enjoyed (including carbonated drinks like beer and soda) without compromise. SimplyThick comes in a spectrum of thickness varieties to suit every need. The Nectar Packets are of the lowest viscosity—a mildly thick consistency that’s thicker than water but thinner than SimplyThick Honey Packets. The individual packets allow for easy, discreet transport anywhere. Bring SimplyThick Nectar packets out to eat at restaurants, sporting events, family functions, the office, and more. For your convenience, our packets are now even smaller for discreet carrying and storage. Each packet is pre-portioned to thicken 4 ounces of beverage. This means that with a packet and a stir with a fork or spoon, you can thicken liquids like coffee, tea, wine, and even ice cream in seconds. Because SimplyThick doesn’t continue to thicken throughout its duration in the liquid, you can also prepare your liquids in advance and store them for later—you can even make your favorites in bulk to save you prep time. SimplyThick Nectar comes in a variety of packaging types to suit your needs. Start with a box of 80 or 200 individual packets, or try a bulk serving to use on 32 ounces of your favorite beverage. Need a little of both? Try our Nectar Starter Kit, which includes 10 individual packets and one bulk packet so you can choose which size works best for you. “As a family caregiver of a loved one with dysphagia brought on by a neurological condition and then a stroke, swallowing thin liquids was not an option. The powdered thickening agents took too long to mix and the grittiness never went away. Then I found Simply Thick over 8 years ago by way of a speech therapist. SimplyThick creator John Holahan knew that liquid thickeners were a must for people with dysphagia, but he also knew that starch thickeners created lumpy, unappealing, and terrible tasting liquids that never seemed to mix completely. Through 16 years of development, John has brought SimplyThick from being one of many liquid thickeners to the premiere thickener brand, with thousands of happy customers — both who have used the SimplyThick family of products and families and caregivers of patients in need who have seen success and relief thanks to its smooth, flavorless, reliable formula.